We announced the launch of the 44m superyacht code-named BVB44M at the Bloemsma Van Breemen shipyard in The Netherlands in August, and she has now completed her sea trials. Exterior and interior design is by Pieter Beeldsnijder and naval architecture by Vripack. Accommodation is for 10 guests in five staterooms while she is powered by twin 1,115hp Caterpillar engines. As her project name implies, she has an LOA of 43.9m and accommodation is for 10 guests in five staterooms while she’s powered by twin 1115hp Caterpillar engines. Ingenious use of space dictated the entire design, and this means some special features, such as a private terrace that runs around the owner’s suite. A spacious, inviting sun deck features a barbecue area, whirlpool tub, bar, and several areas for relaxation, sunbathing or entertaining. BVB44M will have a cruising range of 3,500 nautical miles, a top speed of 15.5 knots, and a cruising speed of 14 knots. 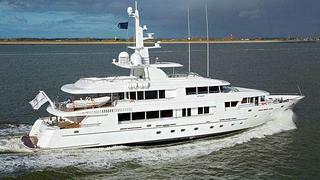 BVB44M is for sale at Edmiston & Company asking €21.5 million.